so for the past 2 weeks i was on attachment at IMH... yes you heard right, literally not kidding. i really dont mind it much at all though since i kinda knew what was to be expected there already. to clear some doubts, though IMH is known for mentally ill patients, they are not literally crazy to the point of no retun, they are really the same as us... just very different points of view in life, or maybe of course they just cant control themselves. so my two weeks a-of attachment there was of course interesting! i mean for every hospital attachment i have to care for the patients from head to toe, but this round, we only had to entertain the patients, byu talking to them and playing games. well the one thing i would really like to complain about, is that though the school actually said that they would pay us for our attachment during vacation period, now they arent paying us for our 3 weeks attachment this round at the polyclinic and IMH... i mean seriously, if you told us that during school days and we have attachment they wont pay us, i fully understand but when during our vacation and just needing to pay us a measly sum of $10 a day and for 15 working days issit that hard? i mean i work outside i mean $7 to $8 an hour depending on what ever part time job i do, which actually equates to about near $60 a day which i can earn. and $10 a day is so hard just to pay for our transport and meals...seriously i think they are really cheapskate. okay no more ranting lol! shall stop! met elaine and jimmy for dinner last friday after my last day of attachment. 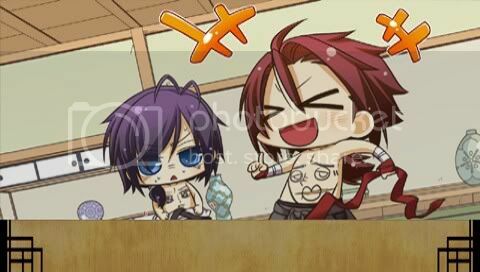 my saito had to learn the belly button dance and sannosuke was the sensei! sannosuke be a big meanie cause he kept making fun of saito lol!